To anyone who reads this blog, I must apologize. Some time ago I had posted that “I haven’t abandoned this blog”, and in retrospect, that’s exactly what I did … at least for a while. When I started this website (intending to document my journey as I transform my hobby into a new career), I made a prediction. I said that I was “certain of only one thing – that the next few years will have some significant challenges”. Those would prove to be some prophetic words indeed! I am in my late 30’s, and have a young family (two toddlers when this started). This past winter, shortly after going back to school full-time on a 3 year program, my wife & I learned that our family would be growing. We were expecting a new baby. In January, while I was on my school field trip to Ruthven Park, we leaned that we were having not one baby, but two! Such exciting times!!! Some would describe a journey like we’re currently on as being ‘a roller coaster’; I prefer Paul McCartney’s description of a ‘Long and Winding Road’. On that day, we went to McMaster Children’s Hospital (in Hamilton) for a more detailed ultrasound than was available at out local hospital. There was some concern about an earlier blood test. 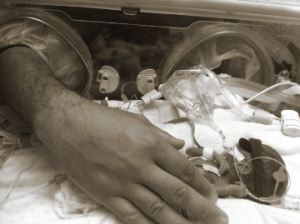 What we found out from those tests, is that there was a rare and serious complication with the pregnancy called Twin-to-Twin Transfusion Syndrome (TTTS). TTTS is a condition where one twin pumps blood into the other through some shared blood vessels, starving themselves of nutrients while over-burdening the organs of their sibling. Left untreated, it is extremely life threatening to both twins. After a very brief meeting with the high-risk obstetrician at McMaster, we were quickly sent off to Mount Sinai in Toronto, expecting to have an emergency surgery that evening in hopes of ‘saving at least one of the babies’. Unless you have been through something like this, I cannot begin to describe the emotional roller-coaster that follows this type of news. Upon arriving at Mount Sinai, things got even more complicated. After a marathon session of scans and consultations with a team of doctors, they determined that we were not only dealing with TTTS, but also with a second almost as rare, and equally serious complication called Selective Intra-Uterine Growth Restriction (sIUGR). The big question was to what degree each condition was affecting the babies. In either case, Twin A was a relatively normal size, but had an excessive amount of fluid and over-stressed organs; while Twin B was very, very small, and essentially had no fluid. The decision was made to hold off on the surgery until one or the other caused a change in their condition. In order to closely monitor the babies, we began going to Toronto every 3 or 4 days for follow-up appointments. On May 1st, the babies decided it was time for them to get some help, and my wife went in for the surgery on the morning of May 2nd. The medical team at Mount Sinai is one of the best in the world when it comes to treating TTTS, and performs most of these laser ablation surgeries for all of Canada (about 150 cases a year). The surgery went well, and we fell back into a few weeks of routine follow-up visits, again every 3 to 4 days. 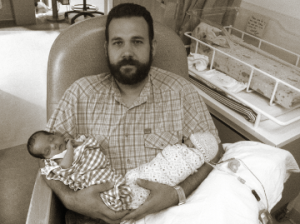 At the end of May, the team at Mount Sinai felt that the babies condition was stable enough that we could be referred back to McMaster (which is closer to home for us), and the follow-ups could be reduced to once weekly…. Well, that didn’t quite work out as planned. Our first appointment back at McMaster was Friday May 31st – during which the doctors were quite alarmed by the babies condition. They sent us home for the weekend with strict instructions to come back at the first hint of anything being ‘not quite right’, and to otherwise take it easy. On the morning of Monday June 3, we came in for our follow-up appointment and found that the babies had both taken a turn for the worse. And so, with no other options left, our identical twin daughters were delivered late that evening by emergency caesarian section; at only 28 weeks, 3 days gestational age. Evelyn (Twin A, the larger of the two, and the TTTS ‘recipient’) was born at 11:17pm on June 3rd weighing 1,260g (2 lb, 12 oz) and was 37 cm (14.5”) in length. Rachel (Twin B, the smaller and TTTS ‘donor’) was born at 11:18pm weighing just 330g (12 oz) and was 27 cm (10.5”) in length. And that is only the start of our journey. Evelyn spent the next 70 days in hospital (51 days in the Neonatal Intensive Care at McMaster, and another 19 days in the Level 2 Nursery of our local hospital) and came home on the evening of her ’10 Week Birthday’. Her sister Rachel is doing well, but had much further to come. 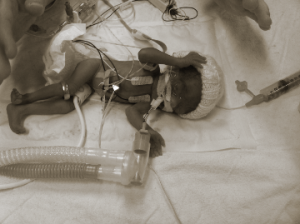 With a birthweight of only 330g, she is the smallest micro-preemie to have survived being born at McMaster in the 40 year history of their neonatal unit. 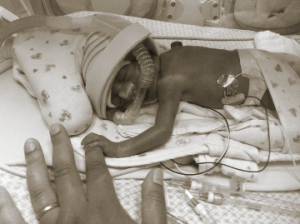 She is still in the NICU, and likely will remain there for several more weeks. Today, is the girls original due date – which we will be celebrating as a 2nd birthday each year. As of today Rachel is up to a whopping 1380g (3 lbs 1 oz) and her sister Evelyn is up to 2780g (6 lbs 2 oz). 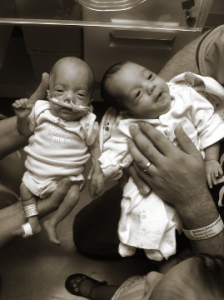 Today also marks the first time that I have been able to hold both of my baby girls at the same time. These were not exactly the ‘significant challenges’ I expected when this all began, but such is life. And I dread to add up what we’ve spent on coffees & meals, and how many hours I’ve spent sitting in waiting rooms or standing next to incubators in the NICU.